A very unique Texas wine experience consisting of six award-winning Texas wineries in one location, the historic Rocky Hill School complex. 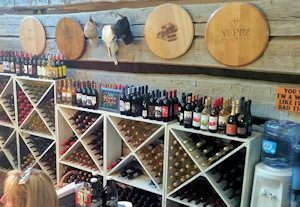 You can enjoy your wine tastings in an old tobacco barn brought in from Tennessee, which is beautiful and rustic, with a very historical background. In addition to the regular wines, they have meads and frozen wine-a-ritas for the person who wants to enjoy a tasty frozen beverage on a hot day. Blue Lotus Winery and Texas Mead Works became valued suppliers and colleagues in early 2017, and Copper Star Cellars joined in during the summer of 2017. Blue Lotus and Copper Star both source all of their grapes from either their own grape vines or from other Texas growers. They also have a party room on the south side of the store that can easily accommodate up to 30 persons.